is five or six months old. While he is young, or while an older dog is being housebroken, you must confine him in a space large enough to permit him to sleep in a separate area from where he relieves himself, but small enough to encourage him to try to control his eliminations. A bathroom or utility room will do, as mentioned above, but it has to be larger if your dog is going to be left there for longer hours. Put down newspapers in one part of the room, and something for your dog to lie on in another part. Leave him a small amount of water. My Borzoi was housebroken by being left in a bathroom while I was at work. It was very effective, and throughout her life, Carla loved sleeping in the bathroom, wrapped around the cool base of the toilet or curled up in the bathtub. In fact, we had to tie the bathroom door open when we were gone because oftentimes Carla would stretch out on the cool tile floor and shut the door on herself by mistake. Another option is to use an exercise pen set up inside. This is a pen without a top or bottom, and it usually folds flat for storage. They are made of eight connecting wire panels, ranging in height from 24 inches to 45 inches. There are also plastic pens called play yards. These are used for both puppies and babies, so you can also find these where baby supplies are sold. They are very lightweight. You can put a sheet of plastic underneath, and then cover the area with newspapers. If you confine your dog in the kitchen, I would suggest blocking off part of the room. Most kitchens are too big for effective housebreaking. With a little ingenuity, you can build a barrier, perhaps with a hinged gate to allow easy access. You can still use a crate to housebreak your dog, but arrangements need to be made to let your dog out halfway through the day. If you cannot arrange to come home from work over your lunch hour during the few weeks or months it may take to housebreak your dog, perhaps you can persuade a neighbor, relative, or friend to drop by and let your dog out. Offer an exchange for their help. Perhaps you could take care of their pet when they are away on a weekend. 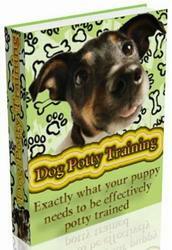 You could also hire someone to come in and let your dog out to relieve himself. Some people leave their dogs outdoors in a kennel or fenced yard while they are away at work. Unfortunately, this is often not safe for your dog. First of all, dogs are stolen out of such enclosures. If you are using a fenced yard, your dog could learn to climb the fence while you are gone. Your dog is helplessly exposed to the teasing of neighborhood children, and this can lead to an aggression problem. Your dog may develop a barking problem that annoys your neighbors. The safest place to leave your dog is inside your house. When you are home, continue to restrict your dog's freedom and supervise him closely to prevent accidents. Pick up any soiled newspapers as soon as you get home, and do not put down fresh ones until you are ready to leave the next morning. The papers are only being used to protect your floor, not to paper-train your dog. Don't let your dog use them when you are home. If your dog tries to relieve himself where he is kept during the day while you are at home, block off that room or area.